We are proud of the success of our ASBIGAP Scholars. Javon Ford graduated from Howard University with a bachelor's degree in Chemistry and now is an Associate Engineer with Savannah River Remediation LLC. Tayannah Rivers completed a bachelor's degree in Biology (with a minor in Spanish) at Howard University. Dial Hoang completed a bachelor's degree in Atmospheric Science at UC Davis and will begin a graduate program in Atmospheric and Ocean Sciences at UCLA. Rosemary Uyeda will complete a degree in Atmospheric Science at UC Davis and is considering her options. Alex Wang will graduate with a degree in Engineering from UC Davis and is considering graduate study in atmospheric science. In addtiion, check out the progress of the alumni from our sister programs, Ecology and Evolution Graduate Admissions Pathways and Molecular and Cell Biology Graduate Admissions Pathways. 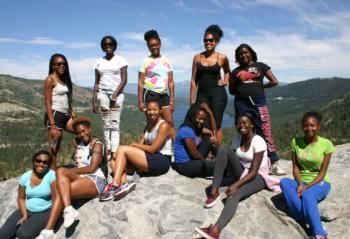 Students from 2014 UC Davis HBCU programs at the Donner Pass Overlook.